Designing effective compensation and benefits packages are paramount in contending for the best talent in today’s competitive labor market. As the economy improves, the demand for landscape services rises, requiring an increase in skilled labor. While this news is good for businesses from a company sales prospective, it creates significant challenges when the national unemployment rate approaches full employment. It becomes a constant challenge to recruit and retain quality employees. Best-in-class firms need to be creative in their recruiting. While company culture is extremely important in determining employee satisfaction, employees need to be compensated fairly in terms of wages, benefits and paid time off. 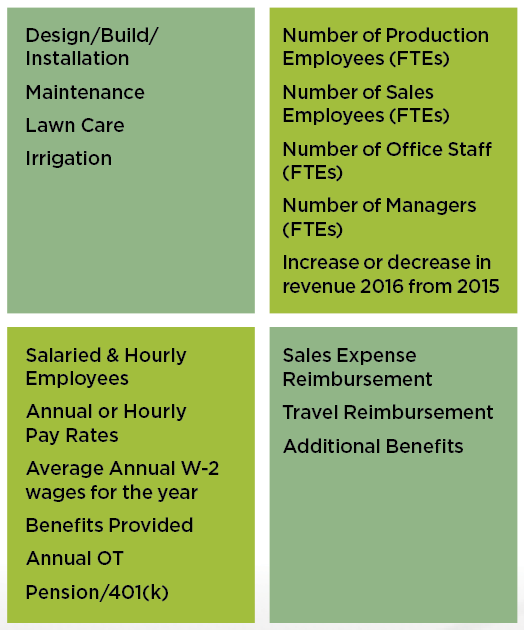 To provide useful information for designing effective compensation programs for our industry, my firm, Turfbooks, in conjunction with Fred Haskett of the Harvest Group, the National Association of Landscape Professionals (NALP) and LM, conducted the 2017 Employee Compensation Report for the landscape industry. The full survey is due out later this year and will be available from NALP. Provide valuable information to the industry. The survey was conducted online in June and July 2017 for the reporting period of 2016. The study includes responses from 230 companies. Items on the survey were worded as positive statements or direct questions and focused on landscape industry employee compensation. Areas of analysis are included in the chart below. It’s clear that employee compensation programs profoundly affect organizational success. The way employees perform their work is often shaped by how their total compensation system is designed, communicated and managed. What are the elements of a compensation program that is both fair and motivating? 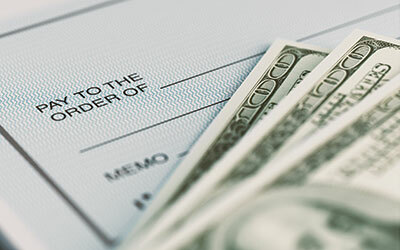 My observations identified four key elements of a successful compensation arrangement. 1. The plan needs to be built to retain competent employees. Over the long term, managing a landscape company is easier when there is lower employee turnover. The wage an employee makes as well as the corporate culture of the firm can dictate the employee turnover rate. If the technician sees his work as a career as opposed to a job, he is more likely to stay and grow with the company. 2. The plan needs to provide predictable and competitive compensation compared to similar job functions at similar companies. The total compensation package needs to provide a livable paycheck week after week. In many places, landscape is seasonal. Companies that prosper can smooth out their revenue and mitigate cash flow issues created by seasonality. While many employees usually make more money in the warmer months, if they are not adequately compensated in the cooler months, they may leave your company or the industry seeking a more stable paycheck. 3. The plan gives each employee a chance to earn a higher income. Commissions and bonuses can be motivating. They need to be easily calculated by both the office staff as well as the employee himself. If an incentive program is not easy to calculate, there can be ill will. Nothing is more demoralizing to an employee than the promise of incentives but, when starting work, finding a dysfunctional workforce and no systems in place to accurately calculate incentive-based pay programs. 4. The plan rewards for loyalty as well as technical competence. Many companies use a compensation grid that breaks their employees into a few ranks. These ranks are often attained after passing some sort of competency tests. Within the ranks, there are minimum and maximum wage rates and bonuses. As an employee moves to the next rank, he earns more. Understanding and comparing current compensation and benefit plans provides great insight into the industry as well as your firm and how it operates in the present. The data points contained in the survey give us a view of what’s in the rearview mirror. However, it may not be indicative of the near-term or long-term future. Just as important as the current data points are the sentiments of the key decision makers whose views of the business and industry environment will influence future compensation and benefit plans. In addition to specific questions about the company workforce, we also asked questions about participants’ outlook for the economy in general, the outlook for the industry as well as business concerns moving into the future. Based on the responses, most agree that the economy and the industry are poised for growth. However, with growth comes challenges. Most of those surveyed feel that general economic conditions are good or excellent for the immediate short term and up to five years into the future. However, most are concerned with the labor market that seems to be tight, which makes hiring a constant challenge. owners must be at least as generous as the competition and find the money to pay their employees. The best way to find that money is to become more efficient in all other areas of their businesses and find savings. The survey looks at wages, benefits and reimbursable expenses from owner/CEO down to the laborers. Job titles surveyed are included in the chart below. 50 employees are not required to provide health care, they need to be able to compete with the larger companies for employees. Therefore, many smaller companies are providing a variety of health care options. 12 percent offered traditional indemnity insurance. 24 percent offered a health maintenance organization (HMO) or exclusive provider organization (EPO) insurance. 3 percent offered point of service (POS) insurance. 12 percent offered a preferred provider organization (PPO) insurance. 6 percent offered high deductible health plan (HDHP) insurance. On a related note, 15 percent of employees who qualified for medical benefits opted out of their employer’s plan. Seventy-five percent of firms surveyed said they have a paid time off policy, including vacation, paid holidays, jury duty, personal days and military duty. Of those businesses that offer paid time off, 26 percent of them allow unused time to be carried over to the subsequent year. service firms usually result in significant restrictions on owners and managers, SIMPLE IRAs provide a method to bypass these restrictions and are relatively easy to administer. Safe harbor 401(k) plans, while requiring more administration than a SIMPLE IRA, also bypass the restriction of the traditional 401(k) and allow greater amounts to be contributed to the plan, including a potential profit-sharing component. Almost half of those companies surveyed provide some type of retirement plan for employees. In the landscape business, our people are our product. What we sell is a service that is provided by our people who operate both in the office and out. Our people must be knowledgeable, competent and take pride in their work. The only way to employ good employees is to design a compensation program that can attract and keep them by creating a plan that motivates and rewards for a job well done. How much do you know about these popular 401(k) alternatives? Gordon is a New Jersey-based CPA and owner of Turfbooks, an accounting firm that caters to land care professionals throughout the U.S. Reach him at dan@turfbooks.com.